Grind green gram to make powder. Take a dry mixie jar and add green gram. Grind the green gram. Fine green gram powder will not look & taste good in this recipe—so do not sift to obtain fine powder. Grind the green gram to a coarse texture and take this powder into a bowl. After one hour of sun-drying the mango pieces cool them in shade for 5 minutes. Keep all the things like a ceramic bowl, mango pieces, oil, green gram powder, salt and red chili powder ready before preparing the pickle. Take a wide bowl and add red chili powder, salt and green gram powder. Mix the spices well. Take 65gms of oil and add little oil to the mango pieces. Mix well to coat all the mango pieces with oil. Add the oil coated mango pieces to the spice mix. Add the remaining oil and mix all well. Take a dry ceramic jar and add the prepared pickle to it. Cover the jar with a lid and place this jar in a dry place for one day. After 24 hours observe that the pickle is wet with juice oozed out of the mango pieces. Mango pieces when mixed with salt oozes out juice. Mix the pickle well & transfer it to a small jar. Add 30gms oil above the pickle and ensure the oil forms a layer above. Keep this pickle jar aside in a dry place. After two hours the pickle tastes good to be served. 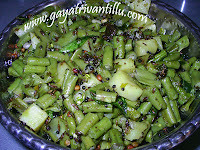 Unlike pickles prepared with mustard seeds powder and fenugreek seeds powder, this pickle does not require the standing period of two or three days. 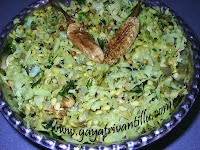 Serve the pickle with hot rice or curd rice. It can also be served as an accompaniment with dal rice. Sun-drying the green gram for one hour before making powder is a good option. Let the green gram powder be slightly coarse as fine powder will not look & taste good in this recipe. Slightly grainy texture brings flavor to the pickle. Adding 30gms oil at the end forms a layer above to preserve the pickle. Green gram powder when mixed with juice of mangoes will not last for a long period. So shelf life of this pickle is less when compared to all other temporary pickles. So prepare in small quantities and enjoy throughout the season freshly. Mee pesara avakaya recipee choosanu.Pesara pappu dry roast cheyala .....vadda.....anedi....naaku...daya chesi telupa kalaru. you need not dry roast pesara pappu. Gayatri garu,I watched most of ur videos and tried too ,all ur vantallu remains my mom.